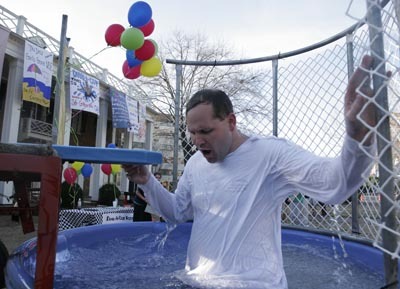 Josh D. Weiss/The Red & Black University Chief of Police Jimmy Williamson emerges from a dunk tank outside of the Chi Phi house on Lumpkin Street during the Spring Break Safety Block Party Tuesday. The fraternity, along with Kappa Alpha and Safe Campuses Now, played host to the program, which aimed to raise awareness for Spring Break safety and featured educational events and safety demonstrations. Every week at the Red & Black all the staff photographers are assigned geographic beats around campus that we have to take stand-alone pictures of. This week I was assigned South Campus. Originally I had taken some photos of the Career Fair that had happened, but it didn’t make for anything all that interesting. However, I took those photos a day early so that I would have time to shoot something else in the event those photos didn’t come out the way I liked. Well, since they didn’t I took a look at the UGA Master Calendar yesterday and saw that there was going to be a spring break safety block party at Chi Phi. Since the sun was just setting I went over with my camera and discovered that the University Chief of Police would be sitting in the dunk tank for a half hour. Knowing it was only a matter of time before he went in, I stood next to the tank waiting to get a shot. This is actually from the first time he went in, I was standing so close at first that I was hit by the splash of water. Anyways, overall I like how the photo turned out with the exception of the color and the crop. The colors seem fairly muted which was probably due to the dunk tank being placed in the shadow of the frat house instead of being directly lit by the sunset. As far as the crop is concerned, I think the photo would look a lot better if the top edge was just above Williamson’s left hand. Right now, his nose is in the dead center of the composition, by getting rid of the sky and part of the balloons which aren’t important to the shot, it adds emphasis to him and cleans the image up since he is no longer in the dead middle. Posted in News, Red & BlackTagged athens, chi phi, georgia, jimmy williamson, university of georgiaBookmark the permalink.